Introducing Disney’s INFINITY, a new video game where a spark of imagination unlocks the freedom to play with some of your favourite Disney and Disney/Pixar worlds like never before! Play in their worlds. Place your Disney Infinity figures onto the Disney Infinity Base to jump into a Disney Infinity play set and experience original adventures in the Disney universe. When hes not helping his best pal, Sulley, Mike can sneak and scare with the best of them. The upbeat, enthusiastic one eyed little joker loves playing tricks. For ages 7 years and over; EAN/MPN/UPC/ISBN: 8717418380977. 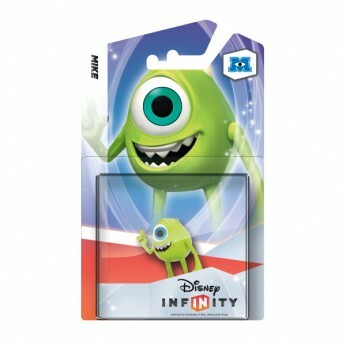 This toy costs approximately £11.99 (for the latest and best prices make sure you check our retailer list for the Disney Infinity Single Character: Mike above). In our review of Disney Infinity Single Character: Mike we classed it as being suitable for ages 7 years, 8 years, 9 years, over 10 years but recommend you check the manufacturer specific advice before purchasing.